This recipe adds a nice twist to traditional hummus. It is very easy to make as well. 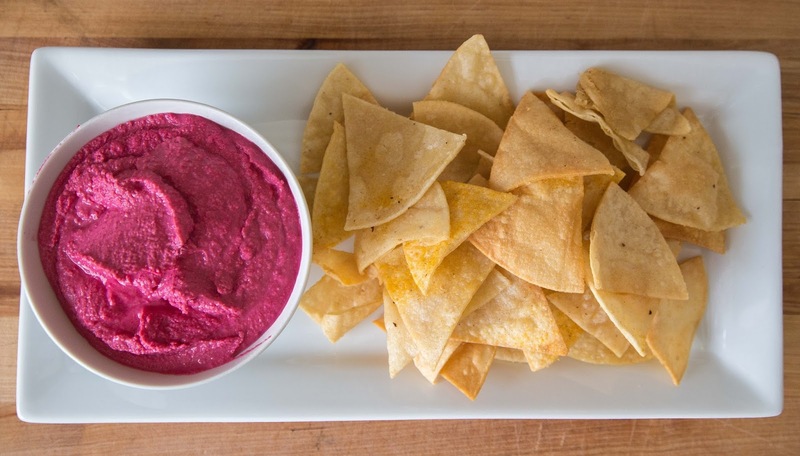 I used my Tortilla Chip recipe to dip it with, but you can use whatever you have (pita, naan, chips, etc...) This hummus recipe comes from my old college roommate and Master Chef Canada Alum, Andrew Al-Khouri. Follow him on twitter @zataartheory. The idea to make beet hummus came from my friend Laura in PEI. - Peel the beets and cut them into smaller pieces. Brush with olive oil and season with salt and pepper. Roast for about 30 mins at 425 until tender. - While beets are roasting, rinse then chick peas well and then bring them to a boil. Once the water is boiling, drain them and add them to the food processor. Warming them up makes for a smoother hummus. - Puree all ingredients in a food processor or blender. Adjust seasoning with salt and it is too thick, add more water. *** Wearing gloves when working with beets will keep your hands clean.